In some cases, a property would like to allocate a different inventory for your OTA channels vs your myfrontdesk/mybookings inventory. 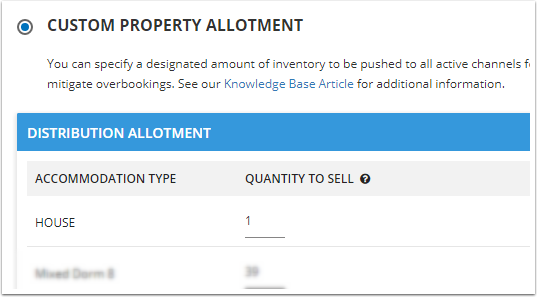 This tutorial will take you through how to activate the property allotment and change the inventory allotment amounts that is sent to OTA's. On Allotment page you may also learn how to set year of how far out you would like to sell your accommodations through the OTAs. This option allows you to select how far out you would like to sell your accommodations through the OTAs. Select how far you would like to send your availability to the connected OTAs. For example, if you select 2 Years, all of your accommodations will be available on the OTAs from today, until 2 years ahead. If you select 3 Years, your accommodations will be available on the OTAs for 3 years ahead. Please note that most channels accept inventory only up to two years in the future. If you set only 1 year ahead, set a reminder to extend the year on 'Allotment' page otherwise you risk not to send the availability and rates to channels connected for the next year. If you do not have your rate intervals set that long, this section will only send out rates till the last interval set within myfrontdesk. With allotment option you may control how many accommodations of specific room type you would like to sell on channels connected. 2. Select your allotment type below. An allotment is the rooms or beds that myallocator pushes to channels. All available inventory will be distributed across all Active channels (the availability you have on myfrontdesk calendar will be sent to channels connected). As soon as inventory is sold on one channel, the inventory is decremented on other channels. You can specify a designated amount of inventory to be pushed to all active channels for each room type. This option will allow you to send fewer rooms to specific channels.